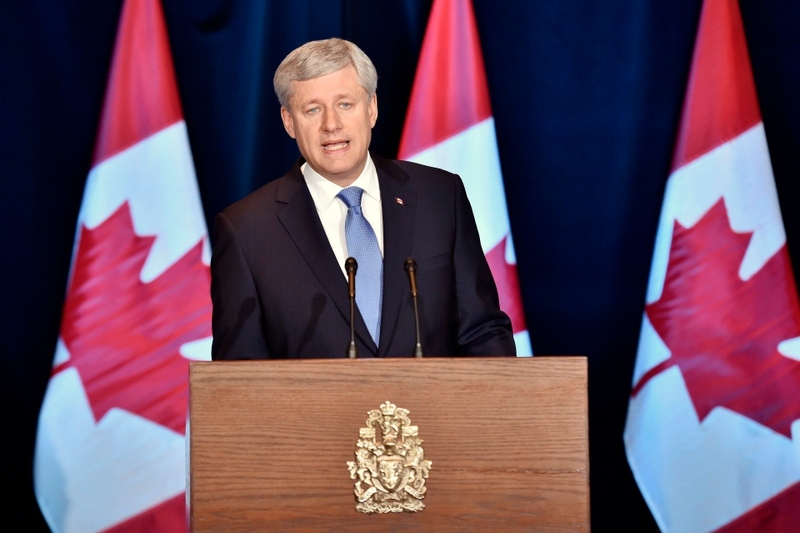 OTTAWA -- Prime Minister Stephen Harper says the federal cabinet has already approved a plan to spend $4.3 billion over the next 15 years to protect Canadian farmers from the impact of the Trans-Pacific Partnership. Twelve nations, including Canada, announced a tentative agreement Monday on the massive Pacific Rim trading bloc, which Harper -- delighted, no doubt, to be making such news in the midst of an election campaign -- billed as the largest-ever deal of its kind. 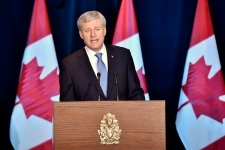 Harper said the historic pact would set a new gold standard for future global trade deals, protecting Canadian jobs today and create more for generations to come as it secures access to crucial markets overseas. "This deal is, without any doubt whatsoever, in the best interests of the Canadian economy," Harper told a news conference. "Ten years from now, I predict with 100 per cent certainty people are looking back, they will say if we've got in it, they'll say that was a great thing. And if we haven't, they'll say that was a terrible error." Harper said the concessions Canada has made in the dairy sector are modest -- an additional 3.25 per cent of foreign imports would be allowed -- and cites the compensation fund as more than enough to protect dairy producers. The announcement marks a watershed in the Conservative leader's election campaign, if not his time in power, and is sure to alter the landscape of the Oct. 19 election. Liberal Leader Justin Trudeau said he recognized the significance of the deal and stressed that while his was a pro-trade party, he would need to review it further before outlining his position. "We will also commit that the ratification process for this deal will go through a full and responsible and open discussion, both in Parliament and with Canadians so that we make the right decision going forward for Canada," Trudeau told a campaign event in Waterloo, Ont. Liberal was at Wilfrid Laurier University to release his party's now-complete campaign platform, which includes more money for low- and middle-income students and easier repayment rules for student loans. Trudeau said a Liberal government would increase grants for low-income students, make it easier for middle-income students to qualify for grants and add $50 million a year to a program that helps aboriginal students. "Too often, the cost of a post-secondary education saddles too many young Canadians with large debts," he said. "We'll ensure no graduate with student loans has to make any repayment until they're earning at least $25,000 a year." Neither Trudeau nor the NDP's Tom Mulcair -- campaigning in Toronto with a glittering team of prominent Canadian film, television and music personalities --could trump the headline power of Harper's trade deal. According to the federal government, the TPP keeps Canada's dairy industry mostly intact, with a modest increase in permitted imports for supply-managed sectors and farmers would be compensated for losses through a multibillion-dollar series of programs. Foreign-made cars would be allowed into Canada without tariffs, as long as they have 45-per-cent content from the TPP region -- lower than the 62.5 per cent regional-content provision under NAFTA. Canada's auto industry has been alarmed about the prospect of loosening domestic requirements for car components. "I know there is also concern in some parts of our auto industry about the implications of this agreement for that vital sector," Harper said, promising to soon announce measures to attract new auto investment and ensure the stability of car assembly operations in Canada. "I want to reassure the Canadians who depend on it for their livelihood that we have reached an agreement that will clearly benefit our auto industry here at home. This agreement will mean the well-paying jobs in the auto sector that they continue to support thousands of Canadian families for years to come."